Otherwordly attacks, death lineups and suspect defences: the questions facing week one of the AFL finals. Earlier this week, alongside the fantastic James Coventry, had a look at the strengths and weaknesses of premiership favourites Richmond. We don’t normally do this, other than plugging Footballistics (out now in all good bookstores), but in our opinion it is well worth a read – and recommending to your friends. The Tigers are not invulnerable, but the Hawks will need to be smarter and more precise with their ball use if they are to turn the tables on them on Thursday night. In the piece we outlined some teams have had success by slowing the game down against Richmond – something that assistant coach Blake Caracella was aware of. The smart move might have been to take the pace out of the game as a result, and not take risky chances out of the 50 and down the ground. Instead, the game ended with 176 total turnovers, dramatically up on the league average of 143 per game. The Hawks played into the Tiger Trap, and they paid the price. There’s still three more games to go this weekend – let’s have a quick look at the key questions facing each side. Can the Dees stop Hawkins and co.? By far the biggest question mark on the Demons season is their ability, or lack thereof, to repel opposition attacks. Especially in the last two weeks of the Home and Away season, the Dees have shown that their midfield can compete with other elite units, and their forward line can hang points on quality defences. But football is a game of scoring more than your opponent, and stopping others from scoring has been hard this year for Melbourne. No finals side concedes more points per inside 50 than the Dees, and the gap is significant. 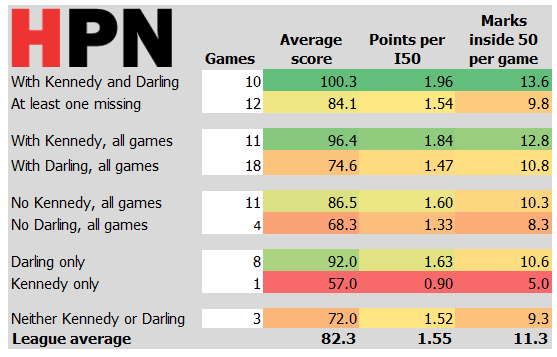 In their two previous games against the Cats this year, the Demons earnt significant advantages in inside 50 differential, advantages that did not see them to victory. In both games, the Cats kicked goals on over 30% of their inside 50s, with Menzel cashing in the first time around and Hawkins the second. There is some hope for the Demons, however, with the return of Hibberd and Sam Frost’s purple-ish patch of recent form. We wrote a few weeks ago about their potentially critical struggles down back, but at the very least, they’re still changing things up and looking for the solution down there. Will Geelong unleash their full midfield force? Here, Clarkson tells both the whole truth and also none of it. Beyond the implementation of a side’s system – which can shift in small ways from week to week – is the way that a coach makes decisions and deploys certain players to fill certain roles within their broader system . At its heart, footy (and all sport) is a game of deploying the right talent in the right manner – fitting a square peg into a square hole. Perhaps the most fun example in global sport right now is the Golden State Warriors “Death Lineup” of Curry, Thompson, Iguodala, Durant and Green – an almost impenetrable unit that can score at will and stop almost any other non-Rockets, non-LeBron side . Given the structure of footy, it’s extremely hard to get an entire side that meshes like that, but it can happen on a unit by unit level. There’s a fair argument that the Swans have had a near perfect defensive set up in recent years due to the versatility of their personnel and their tactical structure, and at time the Eagles forward line can hit those heights (more on them later). But, at least in glimpses of the year, and especially on paper, the Cats’ midfield unit has shown that ability to look nearly unstoppable. We’re not talking about the four listed in the square at the bounce – more about the 6-10 (usually six to eight) players on each side that sort of follow the ball around and facilitate movement. For Geelong, that’s a core of Dangerfield, Ablett, the Selwoods, Kelly, Menegola, Duncan and the ruckman of the week (Geelong are again blessed with a bunch of mobile if slightly hitout-deficient rucks), plus the extras who are in the area. For much of the year they have not always played this group in those roles, instead splitting some around the ground – Dangerfield, Kelly and Ablett often forward, Duncan occasionally off the back of the square. But when they’ve put everyone together, it has been potent, as demonstrated in the tight second win over Melbourne (where that group dominated the clearances in the last quarter) and for parts of their loss to Richmond. Across the year the Cats sit 12th for clearance differential, but when their core are rolling they can beat even the best sides at the coalface, and let their surprisingly talented (but makeshift) defence clean up behind. Can Sydney force a stalemate? Sydney’s midfield performance over the course of the year has left a lot to be desired. They are sitting 15th in inside 50 differential, with a ratio of about 91%, nestled among all the bottom six sides on the ladder. For a good side, they’re getting truly smashed in territory. To make finals despite that weakness, they have won a remarkable 8 games while losing the inside 50 count, something not done in a regular season since Hawthorn did it in 2001. This mismatch in inside 50 entries is partly a product of their league-best defence managing to repeatedly rebound, entry after entry, before succumbing to scores. But it’s mostly because the side has been unwilling or unable to further advance the ball particularly well. Sydney games are safe and slow. Their matches aren’t particularly turnover heavy, with only the 12th-most total turnovers per game between them and their opponents. But Sydney are the only finalist with a positive turnover differential (see the chart above), giving up more than they get back. They’re also slightly negative for stoppage clearances. Neither forcing opponent mistakes nor generating movement from stoppages are particularly reliable methods of gaining the ball for them. Another indicator of anemic midfield performance is that aside from Sinclair, Sydney’s best “score launch” players are half backs (McVeigh, Aliir and Lloyd) rather than stoppage players. Score launches indicate the origin point of a score, the first action in the chain of possessions that hits the scoreboard. The lack of Sydney midfielders in their launches is a sign that frontline inside players like Parker, Kennedy and Hewett are just not creating scores from their clearances as readily as many other finalist midfields. Put all this together and we can start to explain Sydney’s season. Their percentage is the worst in the top 8. Their defence has papered over their midfield losing territory and being unable to generate scores reliably. Many pundits think they look slow and stodgy, but they’ve often managed to make opponents look likewise in relatively safe low-risk, low-turnover games. Often, the ball pings fruitlessly between Sydney’s defensive 50 and wherever they eventually give back the ball via turnover, for opponents to try again. Sometimes opponents wear the Swans down and score, other times a Sydney half back attacking movement via McVeigh or Aliir results in a goal. There is a tendency for games to become stalemates and Sydney are in finals because they’ve turned their share of those numerous stalemate close games into wins. Nine Swans games have been decided by two kicks or less, for 5 wins and 4 losses. 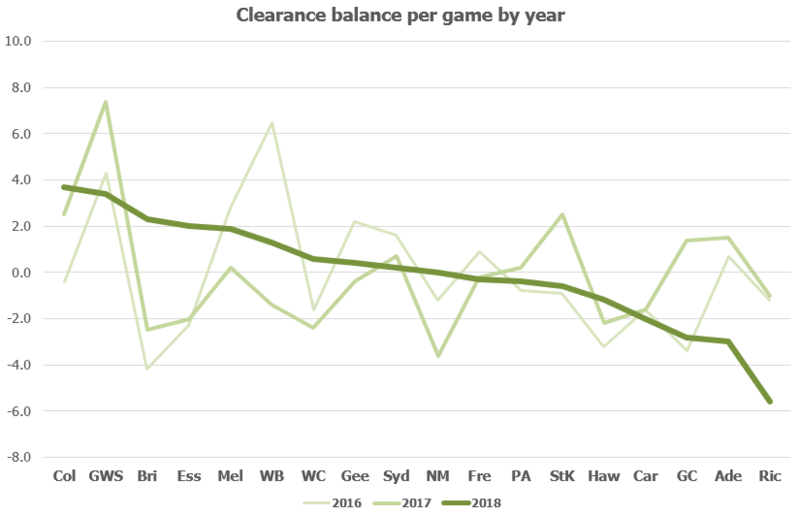 In round 22 against the Giants, in defiance of those dreary season trends, Sydney were actually able to get on top of the Giants in stoppage clearances and slightly edge them in turnovers. This flowed into a positive inside 50 balance, and it meant that Sydney’s forwards didn’t have to make do with scarce supply. Franklin feasted on the greater opportunity. While Sydney have mostly made games close via this grinding stalemate between resolute defence and inability to move forward, against GWS they found some midfield output and it helped them carry the day. They may simply eke out another slow and confusing win, or instead be overrun by the clearly more dynamic team. However, they would surely prefer to repeat the midfield effort from the last Derby, a performance that’s been all too rare this year. This time, however, they’ll have to do it in the face of a stronger GWS side now featuring Kelly, Greene and Williams. GWS have remained a defensive powerhouse, but what about the rebound game? The Giants team taking on Sydney this weekend is stronger than the side that lost in round 22. Greene helps with scoring, Kelly in the middle, and Deledio and de Boer are useful pieces, but perhaps the most important inclusion is Zac Williams, who holds the promise of turning the GWS defence from a useful negating tool back into a proactive offensive weapon. 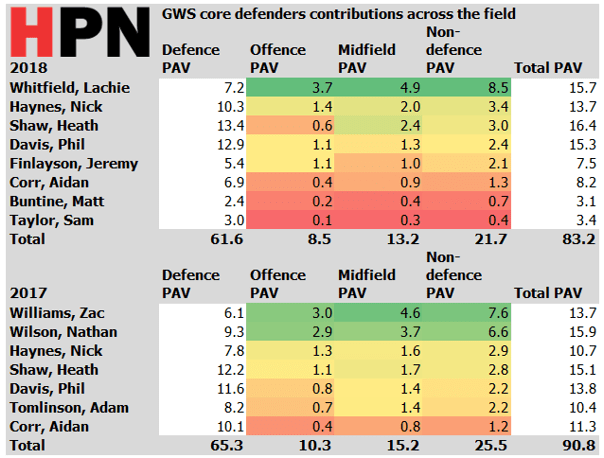 Pundits like to stereotype GWS as a flashy and talented team built from an elite midfield group, but what’s often missed is that the Giants are one of the best defensive sides in the league as well. In 2017 they were the fourth best defensive team, conceding points per inside 50 at about 93% of the league average rate. They’ve improved that this year, having been the third best with a points per inside 50 rate of about 89% of the league average. 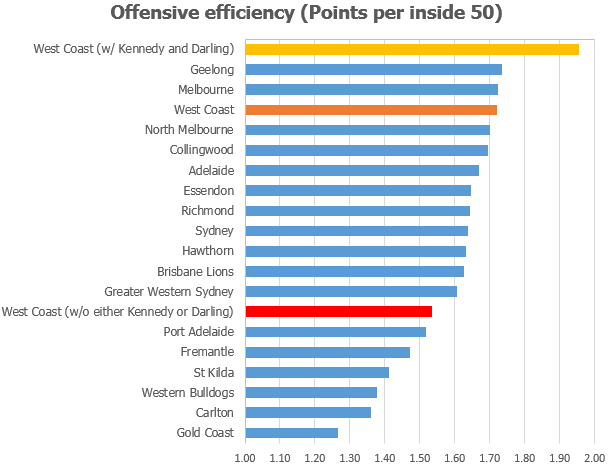 Only Sydney and Geelong have been more effective at preventing scores down back. What GWS have lacked, however, is the fearsome rebounding combination that helped set up incisive offensive play last year. GWS in 2018 have declined offensively and part of the reason (beyond personnel availability) is losing some of their ability to use their defence to generate offence. They’ve held the line, but their offensive output suffered. Across the board, their defenders have not replaced the upfield value that Williams and Wilson formerly provided. Here’s a look at the Player Approximate Value of their main defenders broken up by the area it has been produced. For defenders, Offence and Midfield PAV terms to indicate an upfield attacking role – inside 50s, goal assists. Last year the core defenders were Davis, Shaw, Corr, Wilson, Tomlinson, Haynes and Williams, with Williams, Wilson, Haynes and Shaw all contributing to a very dangerous arrangement of small and rebounding defenders. Over the off season they lost Wilson to GWS and Williams to a season-long injury and have scrambled to fill gaps, with expanded roles for some defenders and pinch hitting from various midfielders. The most crucial moves have been Whitfield’s full commitment to rebound defence, where he’s been about as valuable as either Wilson or Williams were individually last year. Nick Haynes has also expanded his defensive role. This week, Corr, Taylor and Shaw won’t play due to injury. Some combination of Tomlinson, Kennedy, Perryman or maybe Deledio will be used to plug gaps, but most crucially, the dice has been rolled on the return of one of GWS’ two genuine offensive halfback weapons in Williams. Williams provides GWS with something significantly different than they’ve had in defence this year. In theory, Williams plus Whitfield should provide what Williams plus Wilson did last year – twin threats of running and penetrating kicking, creating scoring opportunities in transition to offence. For GWS’ finals hopes this week and into the subsequent finals if they win, Williams’ attempt to recapture his previous form could be crucial. West Coast – Will Plan A work? Josh Kennedy’s return for the first time since Round 18, and just his 12th game of the year overall, promises to lift West Coast’s forward line back into the realm of the sublime. This is no slight on all the smaller pieces who make the Eagles work up forward, but the core of the act is Kennedy and Darling. When the two combine, West Coast’s offence doesn’t just get better, but becomes mindbendingly good. In the ten games played by both Kennedy and Darling, the Eagles’ output has been nearly 2 points per inside 50, which is 126% of the league average. With either one missing, they’ve gone at basically league average offensive efficiency. With both, they’ve been not just the best forward line in the competition but the best by a very long way. Geelong’s 1.73 points per inside 50 is a league-leading 0.18 points better than average over the year. West Coast with their big guns is 0.23 points per inside 50 ahead of them. Their record in those games with both Kennedy and Darling is 10 wins and 0 losses. They beat four finalists in that time including the other three top four sides in Richmond, Hawthorn and Collingwood. In previous years it’s fair to say the Eagles’ already had a great forwardline but was let down by a relatively weak midfield starving them of chances. In 2018, having addressed that area of the ground and dragged their inside 50 balance up to parity, the Eagles are far more able to really exploit their offensive weapons. The question for them is simply how well this works in finals against teams it’s already worked against. Can Collingwood deny the Eagles the chance to go forward? We’re not just talking about straight defence here – the Pies have somehow cobbled together a decent, near league average backline out of borderline AA squad members and spare parts they found out in the reserves at Vic Park (largely due to injuries). Instead, we are talking about supply up the ground, courtesy of their top notch midfield. A couple of weeks ago we noted that the Pies have gone all in on the stoppage game, committing hard to winning tough ball. Unlike Richmond or Melbourne, the Pies defence isn’t as well equipped to cutting off loose ball and rebounding; instead the talented midfield combo and Grundy have to stop it even getting down there. The Pies will want to see a stoppage heavy game, and to limit the number of times the ball goes outside into space quickly for West Coast. That means locking the ball into contested situations, and potentially going down the line more than they would normally. While the Pies have gamebreaking speed, and a lot of their scores come from smaller options, the Eagles’ full strength forward line is absolutely deadly, as outlined above. For the Pies to win, they have to deny the Eagles opportunities even getting the ball up forward with any sort of venom.